Graz, Austria – *The ability to offer a practical, affordable and clean, renewable energy through the use of hydrogen-fuelled cars is to set be demonstrated in Aston Martin’s Rapide S race car entry at the 41st ADAC Zurich 24 Hours of Nürburgring on May 19th-20th 2013. 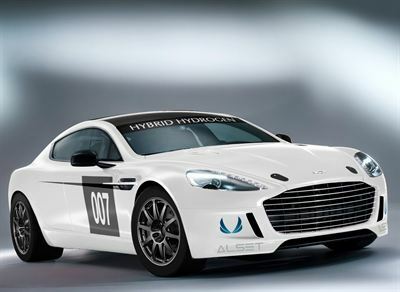 A prototype, twin-turbo, Aston Martin Rapide S will use Alset Global’s unique Hybrid Hydrogen system to run on pure gasoline or hydrogen or a blend of both. Alset Global’s Hybrid Hydrogen system comprises a hydrogen fuel supply system, tank and proprietary engine management system. 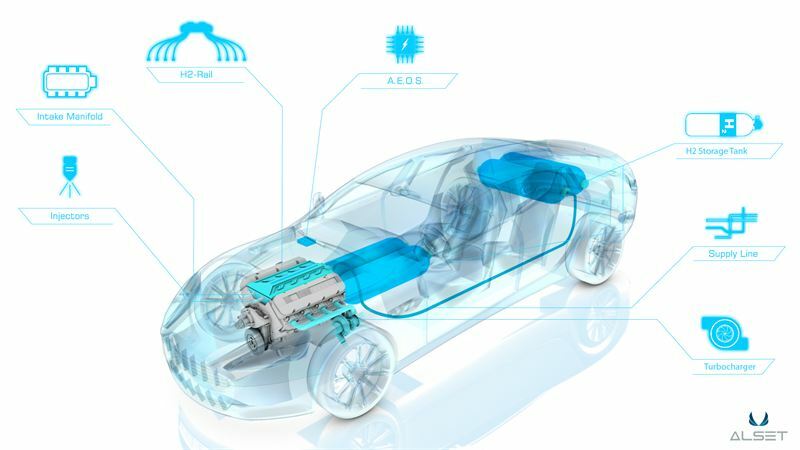 The strength of the Hybrid Hydrogen technology is related to the flexibility of controlling the combustion process according to each particular driving situation: either pure hydrogen, gasoline or an arbitrary blend of both can be selected to ensure optimum power, acceleration and CO2 reduction. This intelligent combustion control results in a powerful and dynamic propulsion system that provides sports car performance but with the carbon footprint of a supermini. Unlike hydrogen fuel cell vehicles, Alset Global’s patented technology, developed over the past eight years, overcomes the lack of a fully developed fuelling hydrogen infrastructure. The simplicity of the Hybrid Hydrogen system means only minimal changes are needed to fit it to conventional engines, thus bringing hydrogen mobility ‘out of the laboratory’ and onto the streets. The ease of introduction and expected premium of just 15 % over today’s new car prices mean that lower CO2 emission target levels, legislated for 2015 and 2020, are now achievable and affordable. Crucially, the Hybrid Hydrogen system will ensure the driving experience is undimmed. In pure hydrogen mode, Aston Martin and Alset Global aim to show that a zero CO2 emissions lap of the Nordschleife is possible with virtually only water emitted from the exhaust pipe. Alset Global and its partner organisations hold a number of key patents relating to the entire system. Injection technology and managing the combustion process form the core of Alset Global’s intellectual property around the Hybrid Hydrogen system. Partners include Magna Steyr, which has developed the storage tank and pressure regulation system, Linde, which will supply the hydrogen and the hydrogen refuelling station for the race, Gigatronik which has supported the safety and tank control concept in developing the hydrogen controller and TÜV SÜD, which certified the technical safety requirements for the hydrogen system. Our system offers, dependent on tank size, a range of up to 250 km with zero CO2 emissions,” says Alset Global’s VP of product management and technology, Thomas Korn. Previously at BMW, Korn has an extensive background working with alternative propulsion technologies such as hydrogen internal combustion engines, fuel cells and electric drive trains as well as the certification and homologation processes. The Nürburgring 24 Hours race takes place on the legendary 25 km long Nordschleife track in the Eifel region of Germany. The world’s longest circuit is not just a stage for spectacular racing; it is used year-round by motor manufacturers and tyre companies for automotive development. The Hybrid Hydrogen Aston Martin Rapide S will make history when it becomes the first hydrogen car to complete a lap of an internationally-sanctioned motor race. Formed in 2005, Alset Global is technology and engineering company working on clean mobility solutions based on hydrogen. With European engineering headquarters in Graz, Austria, Alset Global has developed a unique, patented Hybrid Hydrogen system, to run on pure gasoline or pure hydrogen or a blend of both, which is designed to offer automotive OEMs, vehicle fleets and cities a clean mobility solution in time for new European emission standards in 2020.